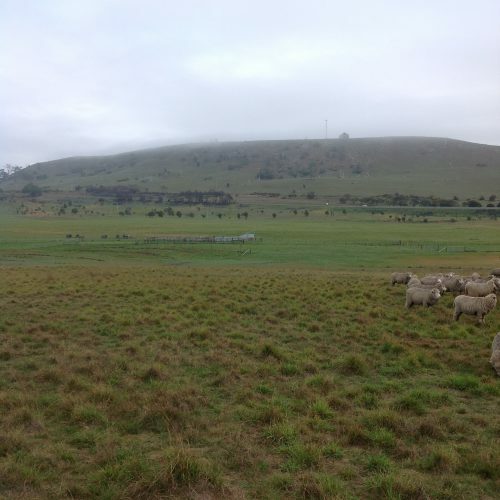 The sheep are now in the Racecourse Grazing area, and the next few days are forecast to bring heavy rain--as much as 60 mm (2 and ½ inches) if we're lucky. But as you know, I wimp out of shepherding when it's really awful weather, so I'd like to give the flock something a bit special today. The flat paddock that was completely burned in the January fire hasn't been grazed since, and though there is still a fair bit of bare ground between plants, the plants themselves have grown well and will have better nutrition content than the new growth. (That's because the plants need sunshine and warmth to fully convert cellulose to sugars--we haven't had the right weather for that conversion since the rains started in early May.) I think the sheep will love it. I'll just give them a once-over-lightly graze, then put them back in the Racecourse proper. The day started with frosty fog, and I've been sluggish to get started (I'm blaming it on my flu shot yesterday ;-) but hopefully the sun will be out before long, and it should be a nice morning. END OF THE DAY NOTES: It was a funny, frosty, foggy morning. I guess the big East Coast Low coming at us was pushing some moist air ahead of it. The sheep were more or less where I thought--on Chicory Hill, resting and ruminating when we arrived (P2). Not long after, though, they got up on their own initiative and started moving in the direction I wanted to go (V1; admittedly, the dogs and I were in the right position to block them going east). I'm learning that if I just set the dogs in position and ask them to "hold", I can usually walk quietly right into the flock, and my special kids will often come up to say good morning, as Clara, Elf and Leo did today (V2). With a bit of persuasion, we moved them downhill toward the Road Paddock, but near the gate, they got quite interested in the lush growth in that bottom corner, and took a sharp right. Aha! thought I--any reason to prevent them? No, every reason to encourage them, so they grazed quite enthusiastically for 15 minutes or so (V3), and were then more or less ready to follow me across the lane way into the Road Paddock (V4) where I left them for about 2 hours, until they finished grazing. I put them back across the lane into Curly Sedge Creek (P4), and they proceeded to move themselves around the northwest end of the Grazing Area at relatively high speed for the afternoon (see the dashed red line on the map). I was quite surprised, because they haven't been moving all that readily without me leading them of late, and the track they took meant navigating 6 gates. From what I can see, no body got left behind. This is it for shepherding, it looks like, until Wednesday. Heavy rain is forecast tonight, tomorrow, and Monday, with total falls possibly reaching 70 mm (nearly 3 inches). We should see significant run-off from this one--maybe even enough to tempt the swans to nest on Swan Lake again this year! P1: 7:50 Chance is ready to go to work, but I'm still inside keeping warm! P2: Pickup. Or rather, lie down. They are having a mid-morning ruminate. We'll just sit down and have a cuppa and wait for them to be ready to move. I'm warmed up by the hike but reckon I'll be shivering before the sheep decide to move! Sauntering off. Not as long as I thought. Put the flask away and follow. Video V2 above. A lovely few moments for me and the kids. P3: This is where we're headed--the big flat paddock between us and the highway. Still in the Racecourse. The sheep decided the wanted to graze this lush corner, so we made a detour. ...and into the Road Paddock--the big flat that was burned to the ground in January. We'll let them go where they want for an hour or so, then back to the Racecourse via Curly Sedge Creek which might even have some water now. Oops. Raining. Not supposed to yet! Into the shed for the rest of my tea! P4: Vicki leading the flock into Curly Sedge Creek.